September 30, 2013: 3,000 hits. Anthony Braxton Comp. 69N Braxton Bootleg 028 - Quintet (Moers) 1977 Tricentric Foundation 2013 AB w George Lewis, trombone; Muhal Richard Abrams, piano; Mark Helias, bass; Charles "Bobo" Shaw, drums. Anthony Braxton Comp. 69N Braxton Bootleg 029 - Quartet (East Berlin) 1985 Tricentric Foundation 2013 AB w Marilyn Crispell, Jens Saleh, bass; Gerry Hemingway, drums. good day, all! happy end of september! Same to you, listener james, and here's hoping, duke! I'm feeling quite congliptious today. Congliptious is a perfectly cromulent word. a simpsonesque open and greeting today! This just in: it's Monday. Hi Jeffs and persons. The fact that Roberto Clemente hit 240 Tatas really makes Matoes curl. A fine day to cry in my clam chowder over the failure of the Giants to make the playoffs. All love to the Pirates. Greetings, Carmichael! How-do, Doug! Go Bucs! Apologies, @pss --- on the fall of the Giants. Someone should move that block off the wicket, the bowler could trip. Also, last night marked the fall of the Walter White drug empire. What the hell will I do on Sunday evenings now?? I have just been informed that my father-in-law's ashes now reside under the piano. This strikes me as something that John Cage never thought of. These coves are possibly using a Kookaburra. Must be a day/night game. @jeff They played an NFL game at Wembley yesterday... That's it. Didn't watch it. @Carmichael - My Little Pony episodes on you tube. @Shaun what next, hamburger joints filling the high street? @glenn: congrats. I believe us Jeffreys have been similarly memorialized. @Brian in UK: Hi! Say what now? @simon over here the rhyming slang 'pony' is pony & trap = crap. @Shaun: American football at Wembley?? Sorry about that. We're getting Premier League action now, so there is perhaps equal confusion/consternation among the USA sports viewership. @Brian I fibbed. Watched 15 mins and saw one play. These Jonathans could learn a thing from cricket about speeding the game up. OK, I'm just going to say: I wish Keith Jarrett had sounded more like this more often. In Doug there is truth. @Shaun where would the advertisements go if you did? What play, late Beckett or some Sartre. @Shaun what is a monkey then? @Brian A tailed primate. That'll be £500. NEXT. Michael Henderson and Jack DeJohnette HOLDING IT DOWN. This is from the third set of the evening...each one featuring a "Honky Tonk." Well Shaun you got me there given I am a Sanders. ...and that great TV show, The Bire. don't forget bomicide: life on the beats! Who's playing vacuum cleaner hose on this? Whoever it is, he's really cleaning up. I can't hear a thing. There is no sound in a vacuum. Thank goodness. Rescued from comment-killing by none other than Uncle Michael! As long as you don't insist upon having the last word. Cubs fire Dale Sveum. Fans clamor for Joe Girardi...except for the knuckleheads who're fixated on missing out on Ryne Sandberg (good luck with that, Philly). Dear Uncle Michael, according to the FMU front page, DJ Trouble has stolen our all-boogaloo show idea and is running away with it tomorrow morning. That's ok...plagiarism is the sincerest form of flattery. Being cartoon characters, we're flatter than most. You can stream a few more cuts from this Claudia Quartet record here: cuneiformrecords.bandcamp.com... Nothing else sounds like this, though. Yup. I'm good like that. Strange dream last night. I was at the WFMU prize warehouse -- but it was a real warehouse, as big as a football field, and in the Berkeley hills, not New Jersey. Inside, there were multiple levels of, not just old DJ premiums and other member goodies -- every kind of wonderful old collectible. I spent hours browsing through it all and trying to decide what to pilfer. Joe Daley, ladies and gents. Tuba maestro. What, exactly, is strange about that dream, pss? The left coast part, obviously. simon, i'd never want to wake up form that dream, but i prob. would, just as i'd found a cache of monkey brain tonic t-shirts. @pss: Ah, yes. That make sense. Totally off topic: is the name "Crybaby Boobie" familiar to anyone here? I asked this question this morning on FB, and got nada -- crickets. I you sure it's not Cryboobie Baby? Probably KPFA, speaking of Berkeley. Simon, that is indeed it! Included as part of the metadata. That used to be a fine station for OUT music. Jeff will you be turning the lights off after the show finishes. I believe America is closed for business. I can sub you a pony. Does it strike anyone that the drummer in the Marilyn Crispell Trio seems a trifle redundant? Well, America is a dog-and-pony show, after all. @Brian: Yeah, sure. Thanks for the offer. Also: what simon said. @pss: Crispell can pound away with the best of them. Eighty-eight tuned drums, indeed. I have 88 crushes on Marilyn Crispell. We played that same exact Crispell Trio cut in May 2012. Sorry about that. It's not past it's use-by date. I once heard an FMU dj -- might've been Rob Weisberg -- say that he tried not to repeat a cut more than once every ten (10!) years or so. I was all, "Yi!" that's a lotta crushes. does mrs. drummersome know about this? Amanda gets obsessed with that, too. I'm like, "Play it every other show if you like it that much!" Just watched 167 thermins play Beathovens 9th. No drummer. In my opinion, WFMU is at its best when the DJs break their own rules and explode their own biases. There can't be 167 Theramins in the world, Shirley! Do not two theremins too close together on their own or jazz might ensue. Sorry I'm late to the party. I did a a bio report on Clemente in the 3rd grade ('84) using 18 resources. I've loved him ever since. Great to see you, @ngh! Hard not to love Clemente. 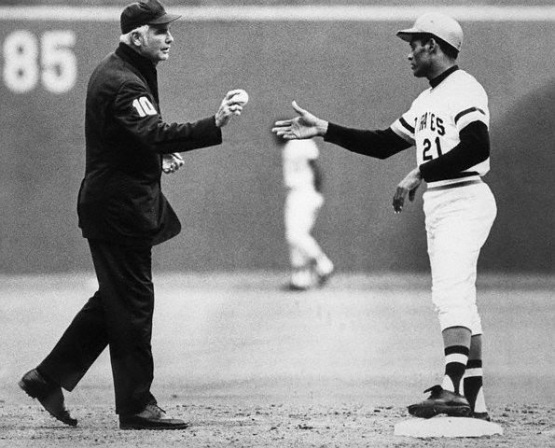 Careful, Doug -- that way lies Kenny G.
(Incidentally, in case you haven't yet moused over the image at left, on this date in 1972, Roberto Clemente got his 3,000th hit. It was his last. hmmm. i think i was in the 3rd grade in 1968. i can't remember anything i did. except i know i ate lunc every day. When I was in 3rd grade, the universe was young, and Adam & Eve rode dinosaurs. Nice work Jeff, time to rustle up some grub. Just had a delivery of Sloes. Time to make up some sloe gin. There's a Roberto Clemente Community center on E 13th b/tn A & B Aves. That sounds like one of those things that would be difficult to confirm from an uncontroversial source. who's the umpire, i wonder? Thanks for the show, Jeff. Thanks for being here to keep the commentary flowing, Uncle Michael! That was gggggggggggggrrrrrrrrrrrrrrrrreeeeeeeeeeeeeaaaaaaaaaaaaatttt! Thanks Jeff! Matt Mitchell, new to me! sweet stuff, jeff and jeff! many thanks. Dipping tonight but cheers, J. The first thing I ever wrote for publication was a Gary Lucas review. I forgot to thank jeff, not the one I already thanked. Thanks, too, @pacific standard simon! Thanks, as well, @listener james from westwood!